Correspondences between geometry and arithmetic form a cornerstone in modern mathematics and lead to a variety of applications. On the one hand, these correspondences appear in precise mathematical shapes and forms, such as the traditional dictionnary between algebraic curves and the arithmetic of their functions fields or between the geometry of differential equations and the representation theory of the fundamental group. On the other hand, they appear as a leitmotif in long-term developments, for example, as the link between automorphic forms and Galois theory in the Langlands programme, or as bridges between the world of error-correcting codes and cryptography. 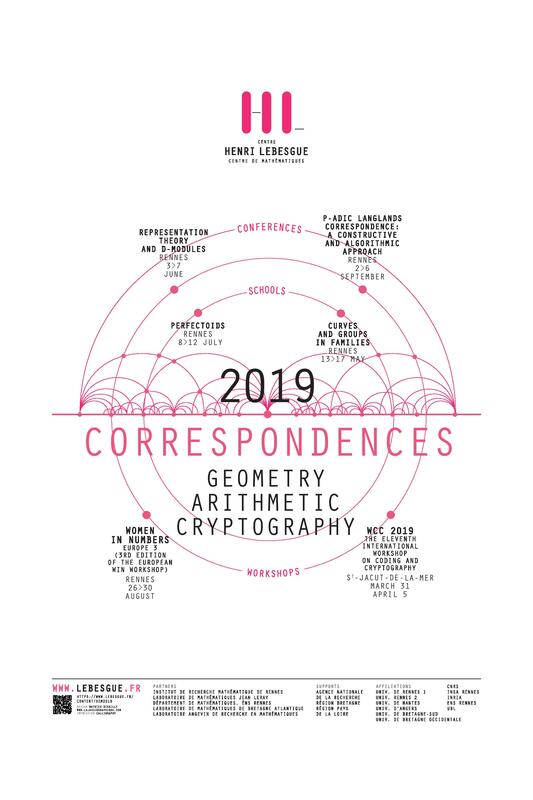 The special semester 'Geometry, Arithmetic and Cryptography: Correspondences', organized by the Centre Henri Lebesgue, has the aim to present recent developments on the interplay between geometry and arithmetic and to stimulate new progress in the corresponding research fields. It brings together leading international experts in the different domains, it offers a thematic framework for younger researchers to meet and interact and provides a training ground for Master and PhD students through several lecture weeks. The semester proposes a variety of different events such as conferences, workshops and summer schools which makes it accessible to a wide range of participants.